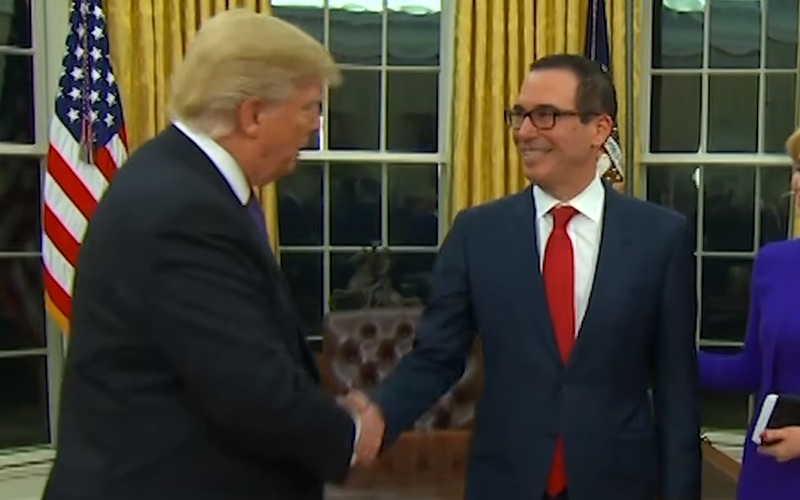 Pulitzer Prize-winning business writer David Cay Johnston on Thursday published an editorial warning President Trump’s Treasury Secretary Steve Mnuchin that he is currently in violation of federal law and could face up to a $10,000 fine, and be imprisoned for up to five years for failing to furnish the president’s tax returns as requested by House Democrats last week. Johnston notes that there is “a law requiring every federal ’employee’ who touches the tax system to do their duty or be removed from office,” fined up to $10,000, and imprisoned for up to five years. Congress could hold Mnuchin in contempt for failing to meet a Wednesday deadline for delivering Trump’s returns to House Ways and Means Committee Chairman Richard Neal (D-Mass. ), Rep. Bill Pascrell (D-N.J.), a senior Ways and Means member, told POLITICO. He also said IRS Commissioner Chuck Rettig should consider stepping down. Last week Neal demanded the IRS deliver Trump’s tax returns by April 10. Mnuchin told the committee that he’s currently consulting with Justice Department lawyers and couldn’t meet Neal’s deadline. Neal is likely to send another letter Friday requesting the returns, Pascrell said.